The Tektronix DPO4054B is available to buy refurbished used or rent, usually from our UK stock. Click here to download the Tektronix DPO4054B datasheet. With the MSO/DPO4000B Mixed Signal Oscilloscope Series, you can analyze up to 20 analog and digital (MSO) signals with a single instrument to quickly find and diagnose problems in complex designs. Bandwidths up to 1 GHz and a minimum of 5X oversampling on all channels ensure you have the performance you need to see fast-changing signal details. To capture long windows of signal activity while maintaining fine timing resolution, the MSO/DPO4000B Series offers a deep record length of 20M points standard on all channels. With Wave Inspector controls for rapid waveform navigation, automated serial and parallel bus analysis, limit and mask testing, and automated power analysis the MSO/DPO4000B Oscilloscope Series from Tektronix provides the feature-rich tools you need to simplify and speed debug of your complex design. 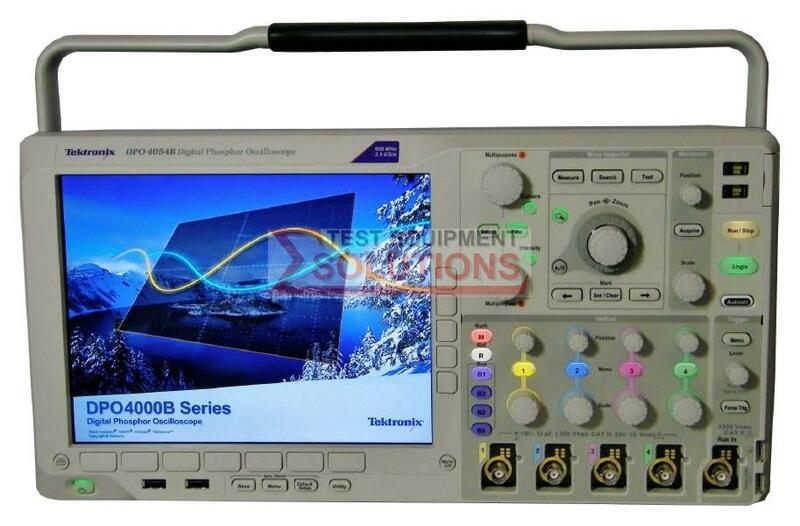 We offer the refurbished used Tektronix DPO4054B 500MHz 2.5GS/s 4 Channel Digital Phosphor Scope for sale and rental. The Tektronix DPO4054B is fully tested and refurbished in our in-house ISO9001 calibration laboratory. We supply manuals, accessories, full warranty and a free-of-charge Certificate of Conformity. We can also provide the Tektronix DPO4054B with a fresh calibration for a small additional charge. If you have under-utilised test equipment talk to us about trading-in or part-exchanging it towards the Tektronix DPO4054B or other refurbished test equipment.